Authored by renatoo on Oct 17 2017, 7:20 PM. 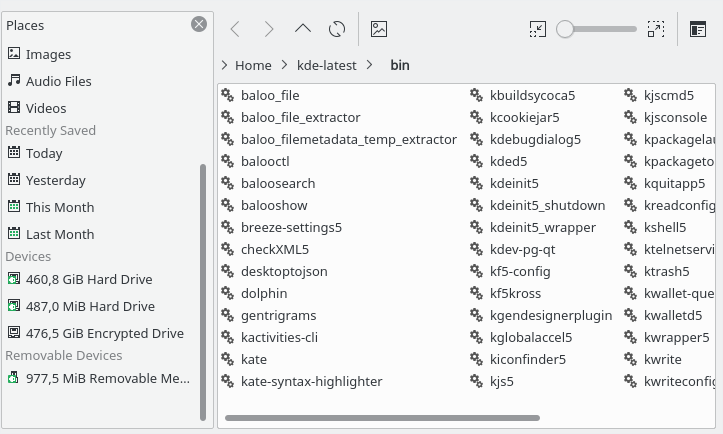 From any kde app try to open/save a file. This special syntax marks them as dependencies. renatoo added dependencies: D8243: Implement support for categories on KfilesPlacesView, D8332: Added baloo urls into places model. Done, Thanks for the information. Braces even on one line block. Early exit to not add unwanted indent. renatoo marked 2 inline comments as done. could you use new connect api please ? Found a small one after all. RemovableDevicesType (since you used the plural on the one above). The removable device gets an "unmount" or "disconnect" icon on hover? Of course, if this isn't an easy change, we may not want to overload the patch. This is not related with the change. I am working on that in a different branch. Update device info if udi changes. Changed the code to always check for udi changes. I tried to implement a unit test for this case, but I could not find a way to simulate it, and manual updating the bookmark udi cases the model to create a new item since uid is used as id for the model items. OK, thanks! Please add me to the review list for that patch, once it's up. @renatoo, now that D8332 is in, this no patch longer applies cleanly. Can you update so I can land it? I updated it. Could you try again.